Capacity: 5-1/4 gal. Keep beverages hot or cold for hours. Perfect for front or back-of-house use. One piece, seamless double-wall polyethylene construction and foamed-in-place polyurethane insulation ensures years of dependable service and prevents liquids from seeping between walls. Molded-in Metal Backing Plates Prevents latches from breaking away from the container. Drip-proof recessed spigot allows for easy access and can be easily adjusted without tools. Wide service opening accommodates larger cups and/or coffee pots when units are stacked on a riser (riser sold separately). Sta-stack interlocking allows for stable stacking. Self-adhesive beverage label set included with each unit. Capacity: 3 gal. 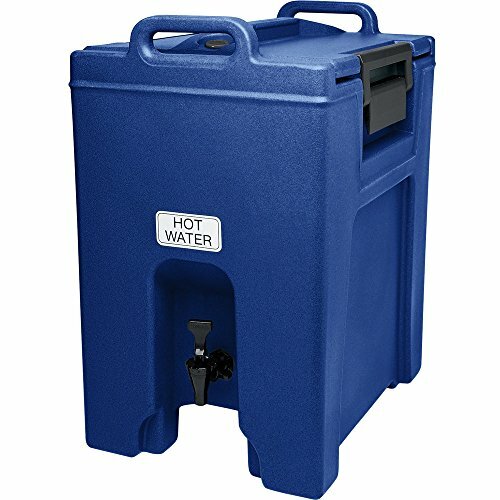 Keep beverages hot or cold for hours. Perfect for front or back-of-house use. 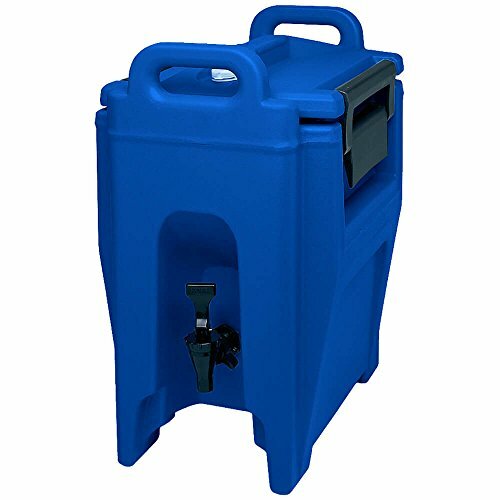 One piece, seamless double-wall polyethylene construction and foamed-in-place polyurethane insulation ensures years of dependable service and prevents liquids from seeping between walls. Molded-in Metal Backing Plates Prevents latches from breaking away from the container. Drip-proof recessed spigot allows for easy access and can be easily adjusted without tools. Wide service opening accommodates larger cups and/or coffee pots when units are stacked on a riser (riser sold separately). Sta-stack interlocking allows for stable stacking. Self-adhesive beverage label set included with each unit. 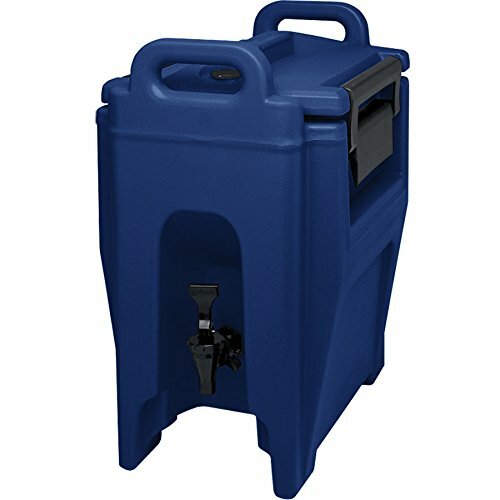 Use this Cambro UC500186 navy blue Ultra Container 5. 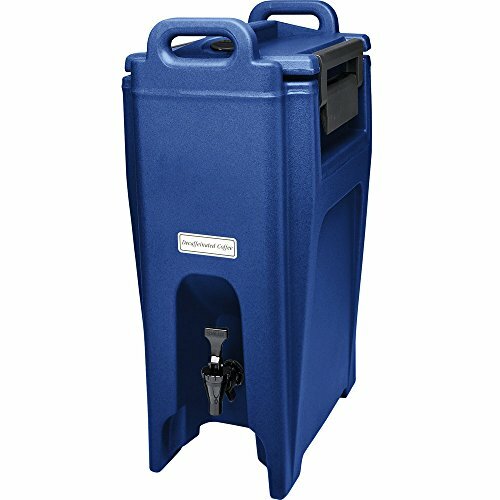 25 gallon insulated beverage dispenser at any catered event. 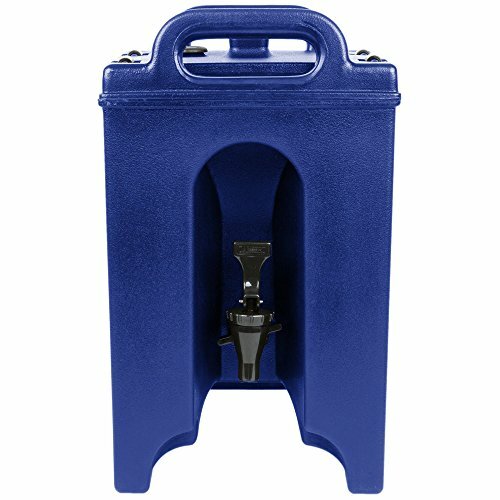 Two large, sturdy plastic latches with molded-in metal backing plates secure the lid tightly, while thick foam insulation keeps your cold drinks cold and your hot drinks hot. 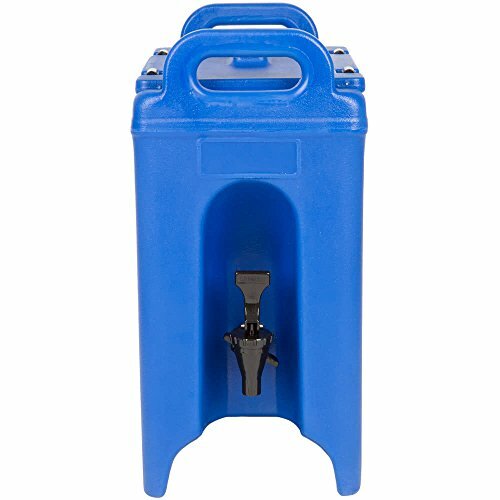 To accommodate larger cups, this Cambro insulated beverage dispenser features a drip-proof recessed faucet, allowing for even dispensing and easy self-service. 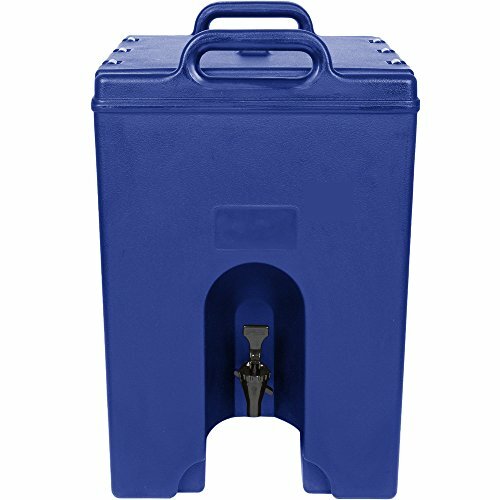 For safe transporting and storage, this unit has E-Z grip molded-in handles and stack interlocking to ensure stable stacking. Overall Dimensions: Length: 16 3/4" Width: 11 3/4" Height: 26 5/8" Capacity: 5. 25 gallons. 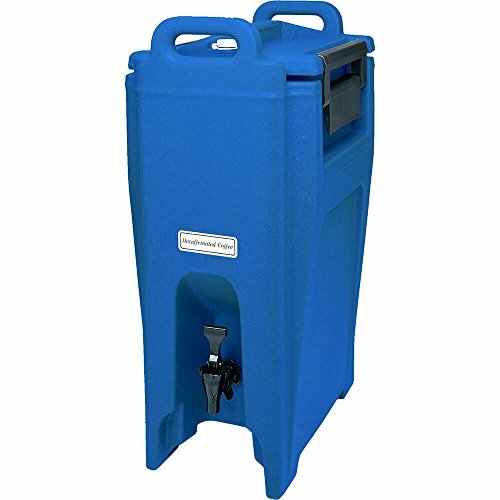 Use this Cambro 500LCD186 navy blue 4.75 gallon Camtainer insulated beverage dispenser at any catered event. 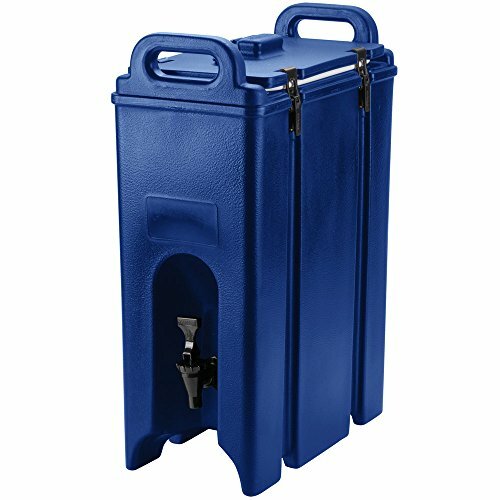 Four sturdy plastic latches with molded-in metal backing plates secure the lid tightly, while thick foam insulation keeps your cold drinks cold and your hot drinks hot.